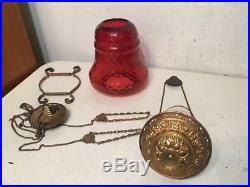 Up for sale is this antique cranberry Glass Shade and brass parts from a pull down oil lamp. I'm not sure if this is everything you need with regard to Chains & hooks, looks like at least 2 hooks missing. Shade is about 8 tall, it has a diamond shaped pattern and is in what I would call bell form or shape. There are some chips along the bottom rim where it rest in the brass bottom, otherwise it's in good shape, just needs a cleaning. Please view all 12 photos to help judge condition. The item "Antique Ornate Brass & Cranberry Glass Pull Down Lamp Bell Form Diamond Pattern" is in sale since Monday, January 22, 2018. This item is in the category "Collectibles\Lamps, Lighting\Lamps\ Non-Electric\Oil". The seller is "matteov772012" and is located in North Haven, Connecticut. This item can be shipped to United States.